I’m not a great fan of sci fi or horror novels. However, on our recent roadtrip to Darwin himself bought a Dean Ray Koontz Jane Hawk thriller. We were both hooked and ploughed through The Silent Corner, The Whispering Room, The Crooked Staircase. Turns out we had started reading a five book series, only three of which had been published. Damn! We polished them all off before we got back home. The next was due to be published in September. 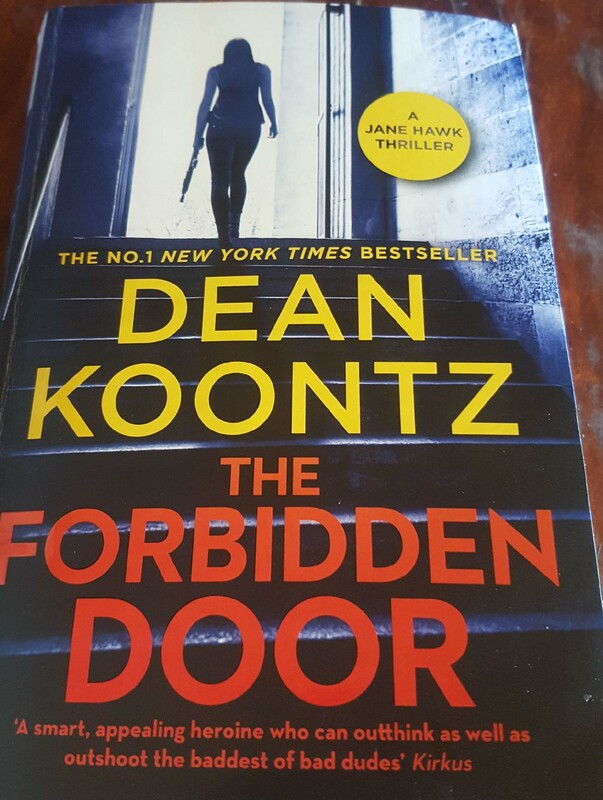 Today, I found it – The Forbidden Door – hot off the press. I might have to hide it from himself until I finish it. Then we have to wait for the advertised explosive climax to hit the shelves in May 2019. Koontz is an American author. According to Wikipedia his novels are broadly described as suspense thrillers, but also frequently incorporate elements of horror, fantasy, science fiction, mystery, and satire. Many of his books have appeared on The New York Times Bestseller List. Essentially the story follows Jane Hawk, a rogue FBI agent who uncovers the evil plot of an organisation called Techno Arcadians. They have developed an injectable substance of incredibly tiny nanoconstructs that migrate through blood vessels and cross the blood brain barrier to form a complex web structure that allows the victims to be programmed. Forgetting who they are, the ‘adjusted people’ can be completely controlled. Those individuals deemed to pose a threat to the new world order are identified by a computer program and placed on the Hamlet List. They suicide on command. Risk eliminated. Jane’s husband was one of the victims. Which is why she started investigating his death. It’s a riveting read. Koontz takes his readers on a fascinatingly macabre journey. Which is sprinkled with wonderful languaging – this from the second page of my newly started read: Just when the faded-denim sky began to darkle toward sapphire overhead and took upon itself a glossy sheen, the breeze quickened and set the oak tree to whispering. goes to Paul Sunstone from Café Philos: an internet café which came to my attention relatively recently. Since then, I have spent many delightful moments in his company. And had many chats. Some irreverently nonsensical, some serious, some in between. Like this one – Pauls-brief-and-saucy-primer-to-the-scientific-revolution. Paul is a prolific blogger. When I last looked he had posted 82 times just this month. He says – ‘At Café Philos, we proudly pick only the ripest electrons on the internet, then roast and brew them into fresh, hearty commentaries on living, religion, the arts and sciences. Fresh posts most days! Paul’s blog is the only one I have come across that has an “About You” page. In it he invites us to introduce ourselves by choosing from a range of questions to help us along the way. I have recently become aware of the possibly alarming fact that I myself have been up until now subconsciously imagining my audience was an undetectable leprechaun farting invisible rainbows beneath my cottage window. Consequently, I wish to update my view of who reads this blog…um…just as soon as possible! Do go visit and leave your paw print. Or invisible rainbow. I love Sci-fi – I write and read a lot of it. Just completed first draft of a new Sci-fi novel last night! – God’s Bolt! Sure to be a best seller. Dean is a great writer. I’ve got a lot of his. Not as good as Ian M Banks though. I have never heard of Ian Banks. If his gift of descriptive languaging is as good as Dean’s I;ll have to check him out. I’m honored you would feature my blog this month, Raili! Thank you so much for that! I very much enjoy our online conversations, too! They’re lively and fun. I’ve read one or two of Koontz’s novels. Scary stuff to me. Like you, I’m not a huge fan of horror, but he’s an excellent author. Just now sent you an email. This is so exciting! I’ve read so many of Dean Koontz’s books, particularity his early ones like Whispers, Midnight. All were riveting. He’s a great writer, as is Paul Sunstone. Prolific is an understatement and he always makes me think. Thank you so much, Miriam! You and Raili are making me blush this morning. Awwww – I rock !!!! I always need a breather after I read a Dean Koontz book! I haven’t read this series yet, I’ll have to put in my TBR list. I have to pace my reading, otherwise I am prone to sit and read it in one hit and nothing will get done! Irreverent he is. And so out of left field at times!